Going for a Sunday Drive down A1A in Jupiter is a treat. To the east are the beautiful Atlantic Ocean, parks, beaches, boaters, surfers, rollerblading, and kite flyers. People watching and serenity at its best in South Florida! To the west are the lucky condo owners who get to enjoy these surrounding on a daily basis. 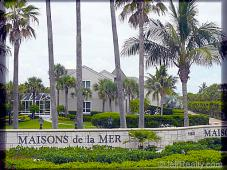 Tucked in between Ocean Walk condos and Jupiter Ocean Racquet Club is an anomaly, just a few estates named the Maisons Del La Mer. A beautiful stone wall outlines the luxury community with tall Royal Palms and wonderful tropical vegetation. 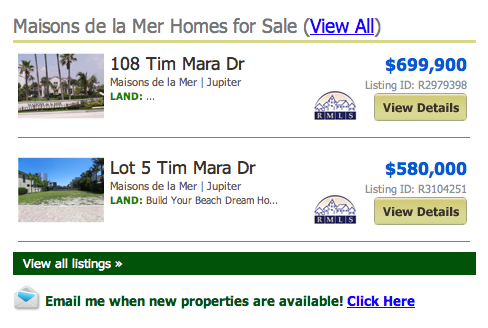 Maisons Del La Mer Jupiter homes were built in the 1990s on Maisons De La Mer Drive and Tim Mara Drive. The smallest models are 2700 square feet with some going over 3500 square feet. Most are 2 levels so as to enjoy views of the ocean. All have their own private pools and some with courtyards. All the Mediterranean style homes are concrete block construction (CBS) and were pampered with granite, tumbled marble, and moldings. An oceanfront single family home with a little bit of elbow roomoff A1A is unusual and will always be a rare commodity. Just steps from the ocean, these limited and unique homes also are close by a number of fine fish eateries, shopping, and movies and of course the best weather in the United States. 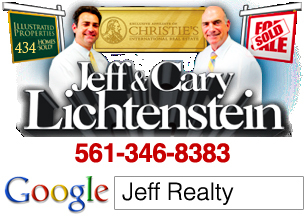 Posted in Jupiter homes, Uncategorized on September 29, 2011 at 2:41 pm.